The Israeli Beresheet lunar lander didn't stick its potentially historic moon landing on Thursday, suffering from a main engine failure in the final moments of its descent. Why it matters: Had it not crashed, the lander would have been the first privately funded spacecraft to land on the moon's surface and the first for Israel. In spite of the landing's failure this history-making mission shows that space is slowly but surely becoming more and more accessible. The big picture: SpaceIL — the non-profit behind the mission — wasn't backed by a government, but instead raised money for the mission through donations from wealthy philanthropists. Only the U.S., China and Russia have successfully soft-landed on the moon. The mission also highlights just how difficult it is to successfully launch a relatively inexpensive mission to the moon. SpaceIL originally conceived of the mission to compete for the Google Lunar X Prize — a $30 million contest to encourage private industry to pave a commercially-sustainable path to the moon. That contest ended without a winner in 2018. Before its failed landing, the lander sent back this selfie. What they're saying: Newly re-elected Prime Minister Benjamin Netanyahu was on hand for the landing. "If at first you don't succeed, you try again," Netanyahu said after the mission's failure. "We didn't make it, but we definitely tried," Morris Kahn, one of Beresheet's financial backers, said. "Space is hard, but worth the risks. If we succeeded every time, there would be no reward," NASA associate administrator Thomas Zurbuchen said on Twitter. "It’s when we keep trying that we inspire others and achieve greatness. Thank you for inspiring us @TeamSpaceIL. We’re looking forward to future opportunities to explore the Moon together." 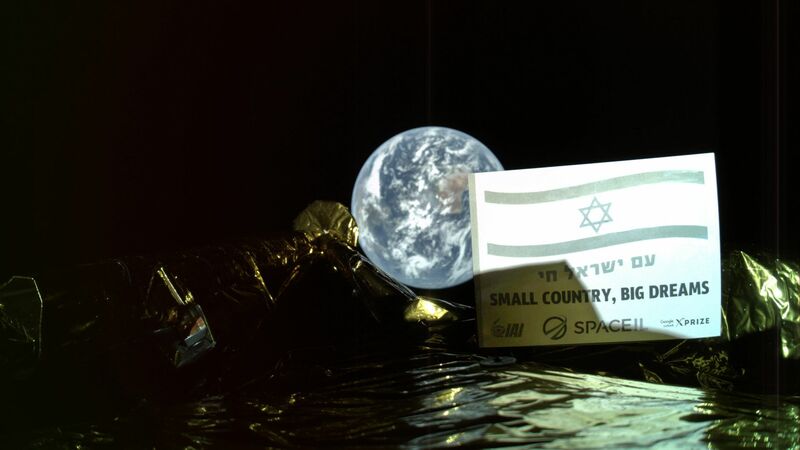 The spacecraft was carrying the Israeli flag along with the slogan, "Small Country, Big Dreams." It also had a NASA instrument aboard.